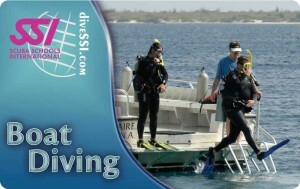 Boat Diving is not just diving from a boat – it is your guarantee for a successful and relaxing first diving holiday! In this specialty you will learn the right boat diving techniques, how to choose the right travel agency and diving operator when planning your vacation, what to consider when traveling with your Total Diving System. Taking this course program prior to your vacation guarantees you will be ready.